AirAsia had their 3rd Anniversary Air Asia Bloggers Community party in Jakarta, Indonesia on November recently. Around 50 over travel bloggers from 12 countries gather together to celebrate as a community in Jakarta. I was thrilled when I saw the email from my inbox. It is such an honoured to be invited and make new blogger friends from different part of Asia countries ( Malaysia, China, India, Taiwan, Myanmar, Vietnam, Indonesia, Brunei and Thailand). So, there are total 4 of us representing Singapore team- Nicholas, Zipeng and Karen. To be frank, I have mixed feelings with AirAsia airline based on my previous flying experience with them. However, travelling with them this time allows me to understand better of the internal team and how they work things right. 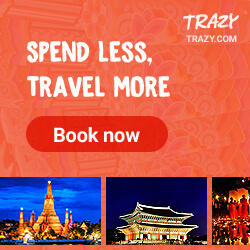 AirAsia is a budget airline and of course getting the right expectation will make your flying experience pleasant. Okay so back to my trip to Jakarta. We were given challenge tasks as YOLO before our flight to Jakarta a day before. There were total of 3 challenges for individual tasks and it was given at a certain time period. 1st Challenge- Post an Instagram video about How You Travel Great with AirAsia. Took this using iphone only. The tasks were given throughout the trip and everyone gets a chance to win away the prize. So, we took the flight from Singapore airport to Jakarta and met up with the Taiwan Bloggers and their PR at the airport before heading to DoubleTree Hilton Jakarta. Upon arrival, we headed for a quick lunch nearby the hotel while waiting for the check-ins to be ready. The first official event starts at night with the Welcome Dinner where everyone gather in a ballroom. We were introduced to AirAsia Santan in-flight Meal Combos and everyone was busying getting the most prefect shot. Dishes include Nasi Goreng, Nasi Kerabu, Chicken Tikka, Rajma Rice, Chicken Satay, Pad Thai and many more from Asia local delights are in the list. The Santan Combo is recently launched by AirAsia which allow guests to pre-book hot meals with a choice of their drink. After the dinner, we were divided into group for the Fun Race group challenge. Names are being called out one by one based on group. Finally I got into my group where I get to meet Team Lenong team members- Nurul & Katrina (Indonesia), Aye (Philippine), Au (Thailand) and Lutfil (AirAsia Malaysia). Once we settle exchanging each other contacts, we are ready to kick start the challenge the next day. Before we start Fun Race challenge, DoubleTree Hilton has arranged for a mini tour around the hotel. I will blog about this in separate post. After the tour is done, we had a group photo outside the hotel before the game officially starts. There are total of 6 challenges where each team member is required to post one challenge with the official hashtag. #Q1: Post an Instagram photo with one of Jakarta’s public transportation (taxis are not one of them!). We decided to post the photo taken inside a bus. It was quite a tricky situation and we managed to capture it with self-timer. We had difficulties posting for this as the ‘wayang’ is all showcased in the display and it is so fragile that we can only see from far. We spent quite sometime inside the museum figuring out which is the best way to capture the moment. The whole process was quite fun as we blend into the local culture taking local transport and explored the old town of Jakarta, Kota Tua.We took few hours and finally completed and headed back to hotel and rest before the Gala Dinner. Singapore Team was not well-prepared for the Gala Dinner as we do not have sufficient time to prepare our costume. Speaking of costume, I think our costumes are quite similar with Malaysia. Anyway, here’s a group shot representing Singapore Team. And with our Taiwan Bloggers- Bob, Ivy and Jessica. Many of the bloggers are well-dressed with their traditional costume. We felt so undressed that night. Nevertheless, it was quite fun witnessing different people from different countries gathered together and share the happy moments together.It was a feast in the eye. And we proceed to the photobooth for photo taking and headed in to the ball room for the buffet. The results of the Fun Race Challenge were announced and our team was shortlisted! But too bad we didn’t won but I think we had a good fun time together. What matter most is the process of the journey. There is also a prize for Best Dressed and Au (Thailand) won the challenge. Gala Dinner ended well after all the prize-giving ceremony and everyone headed back hotel and rest. Instead of resting in the hotel room, I met up with Taiwan and China Bloggers at the hotel bar and had a nice chat throughout the night. It was quite fun and memorable ones. It is so magical to gather strangers sharing the same passion at one platform and turned to friends throughout the journey. It is quite valuable and not everyone has the chance. I am blessed and glad to be one of it. Thank you AirAsia for having me as part of the #AABC2016 Blogger community Party! Hope I get to go again next year to India! Previous Post[JB EATS] HOKKAIDO BAKED CHEESE TART & TOKYO SECRET –Baked Cheese Tart craze finally in Johor BahruNext Post[SG EVENT] SOPHISCA MADE YOUR CHRISTMAS EVEN SWEETER!